“Two crises – one solution.” This was the slogan of the People’s Climate March in Seattle on September 21. Organized in solidarity with the historic march in New York City, the event in Seattle highlighted how the the environmental crisis and the economic crisis could be addressed together with bold policies like a green jobs program. The event gave a glimpse of the potential to build a powerful movement against the corporations and politicians that stand in the way of tackling climate change. More than 2,000 people packed Westlake Park, a traditional location for protest in Seattle. Nearly every environmental and social justice group in Seattle participated, including Idle No More, 350.org, the Green Party, Divest University of Washington and Seattle University, the Sierra Club, Rising Tide, and more. Even NGOs that don’t normally mobilize for such events did so. 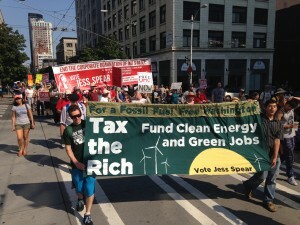 Jess Spear, Socialist Alternative’s candidate for the Washington State House in the 43rd legislative district, was one of the central organizers of the event and chaired the coalition meetings that brought together nearly every environmental group in Seattle. She spoke at the beginning of the rally, calling for a united movement of labor and environmental groups. Lapointe and other speakers called for direct action – civil disobedience – to stop dirty fossil fuel projects, like the proposal to build North America’s largest coal export terminal near Bellingham, Washington. Just three weeks ago, Lapointe and several other protesters were arrested for blocking an oil train in a protest against the dangerous movement of mile-long oil trains through highly populated areas like Seattle. In fact, just two months ago an oil train derailed in Seattle. Nobody died in that derailment, but it highlighted the immediate danger posed by these trains that have exploded in other derailments, such as the one in a Quebec town that killed 47 people. 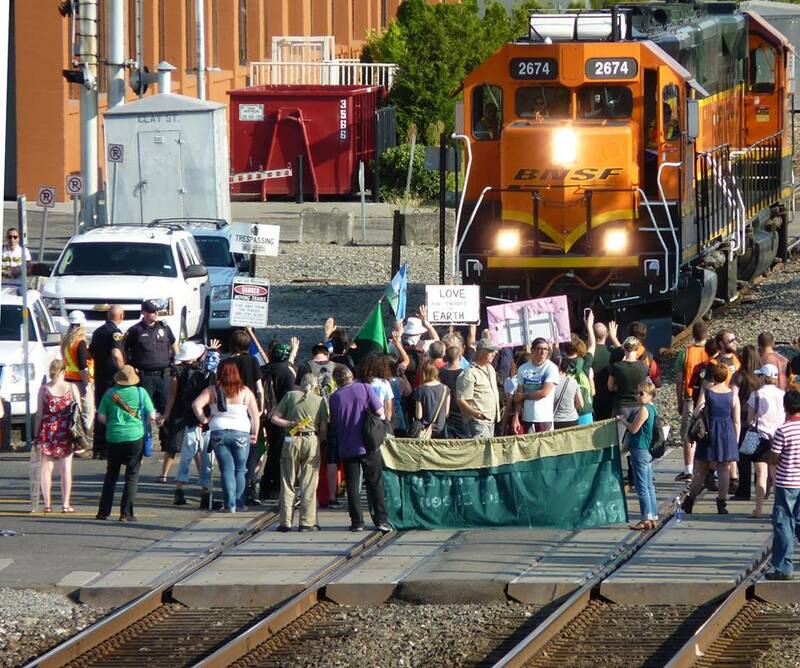 Since then, there have been at least three separate attempts to block the train tracks between Seattle and Bellingham to protest oil trains. It was out of one of these blockades that the whole idea for a march in Seattle in solidarity with the NYC People’s Climate March originated. Jess Spear was arrested along with two other activists from Socialist Alternative at the end of July for blocking oil train tracks. This was just one week after the derailment in Seattle. Spear’s protest forced the city government to admit that they had no emergency plan for oil train derailments. Meanwhile, Spear and Socialist alternative used the moment to put out the call for the September 21 action. In the end, Jess Spear and Socialist Alternative brought together nearly every environmental group in Seattle. This was not just due to the energy we put into the mobilization, but, more importantly, the new period we are in. There is a growing recognition that the political establishment has completely failed to address the challenge of climate change. Millions had hopes that President Obama would boldly take it on, but instead we have seen the expansion of fracking, coastal oil exploration, and mountaintop removal mining. The protests around Keystone XL have helped foster a growing mood that it’s time to take matters into our own hands, to build a mass movement, and to take direct action. This mood found a powerful expression at the end of the People’s Climate march in Seattle. 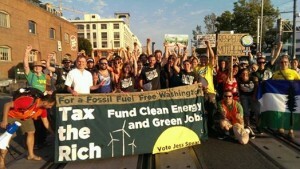 After marching from Westlake Park to Seattle’s waterfront – chanting the entire way for green jobs and stopping oil trains – hundreds of activists stopped on the train tracks and blockaded the BNSF engine for almost three hours. For most of the blockade, there was a tense standoff between the protest and a BNSF train engine that we refused to let pass. Meanwhile, 70,000 people were about to leave a downtown stadium following the NFL football game between the Seattle Seahawks and the Denver Broncos. Thousands would take a commuter rail home and need to pass through our blockade. Socialist Alternative member Ramy Khalil led protesters in a discussion about what to do. In the end, we gave BNSF two options: they could back the train up and move it off the tracks allowing the commuter rail train to pass, or they could allow the commuter rail train to pass on the opposite tracks. But, we made it clear that we would hold our ground against the train engine. 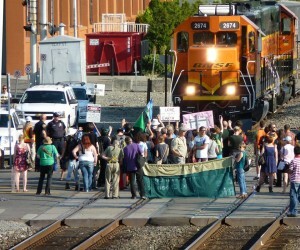 Clearly, BNSF was trying to avoid arresting hundreds of people. In the end, they were forced to back down and they moved the train off the tracks to allow the commuter rails through. It was a powerful victory for our protest, and showed the potential for even larger mass direct actions to win real victories for working people and the environment. The rally and march of 2,000 people along with the blockade by hundreds represent a huge step forward for the environmental movement in Seattle. Over the next weeks and months we have the potential to build on this success with more mass oil train blockades and direct actions. 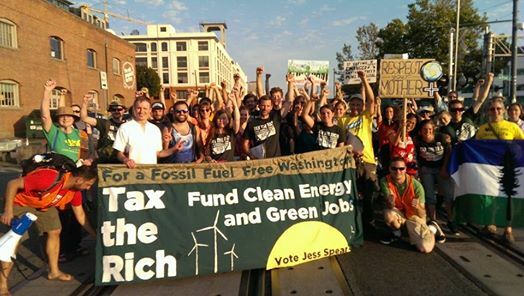 But also we have the opportunity to put a climate scientist and working class activist in the Washington State house with the election of Socialist Alternative candidate Jess Spear. 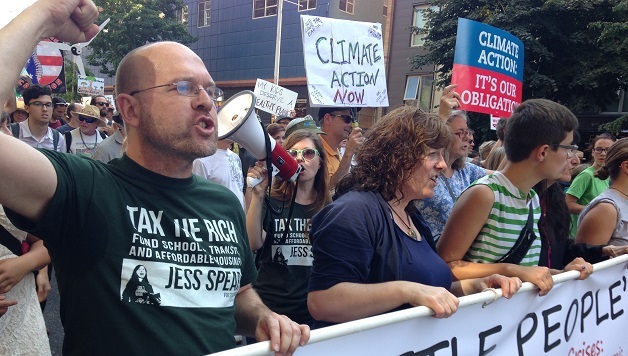 After yesterday’s actions, it’s clear to many environmental activists in Seattle: Jess Spear is no ordinary candidate. When was the last time there was a candidate in Washington that was willing to risk arrest twice in two months to help a movement stop dangerous oil trains from coming through our communities? In reality, we need more candidates like Kshama Sawant and Jess Spear – candidates from our movements who fight uncompromisingly for what working people need, not what is acceptable to the corporate bosses. Everyone inspired by the march and blockade in Seattle should get involved in the Vote Spear campaign, volunteer, and donate today. Click here to see an interview with Jess Spear. Donate to help the campaign’s success!